Check out Short Story: A Lesson In History: does it looks familiar? Yes, that Short Story and this page 15 of SoD: Trannis were drawn by two different line-artists after a misunderstanding. Instead of throwing one of the pages away, the dialogue was rewritten to show a more ironic angle of the same event: the boring history lessons of Shockwave. But that's the price of power, right? In panel 4, Shockwave's words reflect Omega Supreme's recap of the Cybertronian history, as seen in page 1 of SoD: Omega Supreme. The computer screen on the left features the apex of the ancient battle between Nova Prime and Guardian Prime (aka the Anti-Prime), as chronicled in Short Story: Throwdown. This battle is a sample of the ancient history that only a few mechs (such as Shockwave) still remember. The computer screen on the right shows some buildings from another forgotten corner of Cybertron's history. Their architecture is a tribute to the Crystal Castle of She-Ra: Princess of Power, featured in the online fancomic The Coming of the Towers, which is written and drawn by some familiar faces. Speaking of that universe, the Anti-Prime might be a tribute to the Anti He-Man of the German Masters Of The Universe stories. 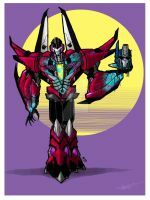 The mech in panel 5 is Pion Rex, a proto-Prime from the Lawless Times of Cybertron. Check the link for the story of the character throughout the continuities, starting with The War Within. Pion Rex is also featured in the characters art gallery: the Predator King and the Lawless Times king.